It is my dad's fault. If he had allowed me to eat my cereal from his 'special bowl' I would not own all the Pyrex nesting bowls I do today. 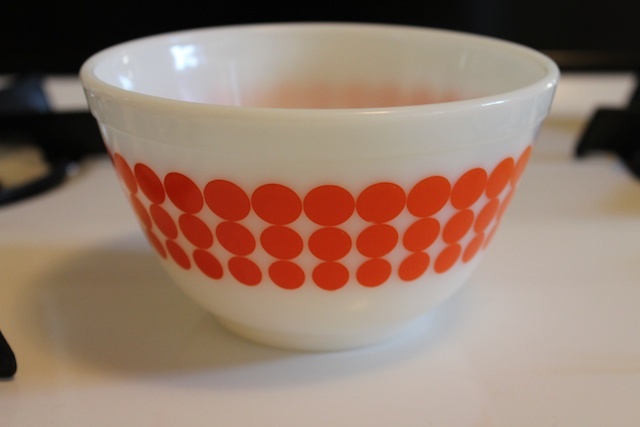 His new dots orange bowl was off limits. Forbidden. Us kids were reduced to eating out of Tupperware since only grown ups ate from breakable ware. Some kids can't wait to grow up so they can drive or get drunk, or gamble, or get a low paying job for a sense of freedom. Me, I just wanted to grow up so I could have cereal from a real Pyrex bowl. 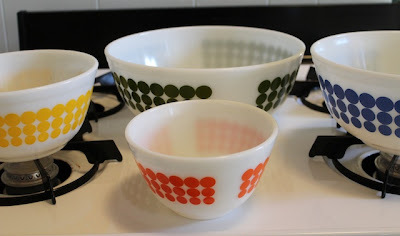 I started collecting Pyrex in my early 20s. My first design was Butterprint (aka the Amish looking one). I was still in my blue phase. Not ready for the big kids table yet. As my palette matured I started piecing together the primary color set. From nesting bowls to refrigerator containers, the solid colors are now MINE. For a while the polka dots from my youth haunted me. I knew without the dots I would always be beaten up in the Pyrex schoolyard. So then I added stripes.